Atahualpa or Atawallpa (c. 1502 – 1533) was the 13th, and last, emperor of the Tahuantinsuyo, or Inca empire. He became emperor upon defeating his older half-brother, Huáscar, in a civil war sparked by the death of their father, Inca Huayna Capac, from an infectious disease thought to be malaria or smallpox. During this civil war, the Spaniard Francisco Pizarro crossed his path, and by sheer luck, captured Atahualpa and used him to control the Inca empire. Eventually, the Spanish executed Atahualpa, ending the Inca Empire. Cultural destruction followed on a large scale. It took just eight years for the Spanish to all but destroy an ancient culture, replacing it with a less just system with slave owners and slaves. Under the Incas, consumption and food production had been carefully balanced, with everyone contributing to the good of the community and everyone receiving enough. The etymology of his Quechua name Atawallpa is far from certain—the popular suggestion that it comes from Ataw Wallpa and that this would literally mean something like "happiness fowl" (supposedly a totemic bird), seems to be no more than a folk etymology. On the death of their father, Huayna Capac, and their older brother, Ninan Cuyochi, who had been the heir apparent, the empire was divided between the two surviving brothers, Huáscar and Atahualpa. Huascar got the major part of it, containing the capital Cusco, and Atahualpa the northern parts, including Quito, his mother's family's ancestral home. For a couple of years, the two brothers reigned without problems. 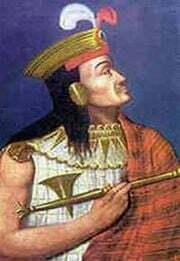 But Huascar, who considered himself to be the real Sapa Inca (emperor), because he was a legitimate son of Huyna Capac and his sister, demanded that Atahualpa swear an oath to him. Atahualpa refused, and the civil war began. Huascar, who controlled the major part of the empire, invaded the north with a great army and soon captured Atahualpa. Atahualpa fled from captivity with the help of a small girl, and united himself with the generals Chalicuchima and Quizquiz. He gathered an army and defeated Huascar in the battle of Chimborazo. Atahualpa then pressed forward and began to recapture the empire, and also the town of Tumebamba, whose citizens he punished in gruesome ways because they were on Huascar's side in the beginning of the civil war. The final battle took place at Quipaipan, where Huascar was captured and his army disbanded. Atahualpa had stopped in the city of Cajamarca in the Andes with his army of 80,000 troops on his way to the south and Cusco to claim his throne. By this time, the Spanish conquistador Francisco Pizarro had established the city of Piura, the first Spanish settlement in Peru on July of 1532. After a two month march, Pizarro arrived at Cajamarca with 168 survivors under his command. He sent Hernando de Soto (1496-1542), friar Vicente de Valverde (later a bishop) (1490-1543), and native interpreter Felipillo to speak with Atahualpa about the Spanish presence. Through the interpreter, Valverde delivered the "Requirement," indicating that Atahualpa and his people must convert to Christianity, and if he refused he would be considered an enemy of the Church and of Spain. Atahualpa refused the Spanish presence in his land by saying he would "be no man's tributary." The Spanish envoys returned to Pizarro, who prepared a surprise attack against Atahualpa's army in what became the Battle of Cajamarca on November 16, 1532. According to Spanish law, Atahualpa’s refusal of the "requirement" allowed the Spanish to officially declare war on the Inca people. When Atahualpa coldly asked the priest Valverde by what authority he and his people could say such things, Valverde offered him a Bible, saying that the authority derived from the words in it. He examined it and then asked why di,d it not speak to him. He then threw it to the ground. That gave the Spaniards the excuse they needed. They opened fire, and over the course of 2 hours more than four thousand unarmed Inca soldiers were killed. 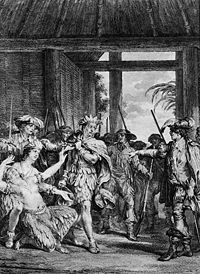 The Spanish then imprisoned Atahualpa in the Temple of the Sun. Atahualpa could not believe the Spanish intended to take control of his kingdom. He thought if he gave them the gold and silver they sought they would leave. In exchange for his release, he agreed to fill a large room with gold and promised the Spanish twice that amount in silver. Although he was stunned by the offer, Pizarro had no intention of releasing the Inca because he needed the ruler's influence over the native people to maintain order in the surrounding country or, more to the point, he meant to depose Atahualpa, placing the entire empire under the rule of Spain's King Charles I (Holy Roman Emperor Charles V), with himself as viceroy. Outnumbered and in fear of an imminent attack from the Inca general Rumiñahui, the Spanish saw Atahualpa as too much of a liability and after several months decided to execute him. Pizarro staged a mock trial and found Atahualpa guilty of revolting against the Spanish, practicing idolatry and murdering Huáscar, his own brother. Atahualpa was sentenced to execution by burning. He was horrified, since the Inca believed that the soul would not be able to go on to the afterlife if the body were burned. Friar Vicente de Valverde, who had earlier offered the Bible to Atahualpa, intervened again, telling Atahualpa that if he agreed to convert to Christianity he would convince the rest to commute the sentence. Atahualpa agreed to be baptized under Christian faith. He was given the name Juan Santos Atahualpa and, in accordance with his request, was strangled instead. Atahualpa died on August 29, 1533. He was succeeded by his brother, Inca Tupac Huallpa, and later by another brother Manco Inca Yupanqui. Atahualpa's handling of the Spanish invasion notwithstanding, his actions leading up to the time of the invasion did contribute to the fall of the empire. One could see the parallel with Harold Godwinson's feud with his brother Tostig, which lead to the civil war and the Battle of Stamford Bridge and subsequently to the Battle of Hastings as it severely weakened their positions in a time of crisis. In Atahualpa's case, there were less than 200 Spaniards and 1000 Native allies, it is easy to understand why Atahualpa did not immediately sense the threat. Unlike Montezuma, who may have seen the Europeans as representatives of a returning deity, he quickly saw them as human beings and intruders to be dealt with at their leisure. For all their weapons and horses he knew he had more than enough soldiers to handle Pizarro. In fact, Atahualpa was planning to speak with them and then arrest them. He planned to put Pizarro and his officers to death. He would retain the needed specialists, such as the horsebreaker, blacksmith, and gunsmith to equip his army. In short he was planning on having Pizarro for lunch—but Pizarro had him for breakfast. This page was last modified on 21 November 2012, at 16:07.